How to choose the right metal for your engagement ring. As white metal jewellery is becoming more and more popular over the classic yellow gold, and with more options for white metal than before, what are they and which one is the best for you when choosing your engagement ring? Platinum 950 and 18K white gold are the top choices for engagement rings, but depending on the style of ring you want to have made, or your general lifestyle, there are some important facts you should know about these metals when making your decision. Platinum 950 is made up of 95% platinum and 5% alloy. Making it one of the purest metals for jewellery available on today’s market. As it is such a pure metal, it is softer and it will scratch more than gold. When this happens the metal displaces, which means that metal is not lost through wear and tear, it will retain its original weight for years to come. There is a risk of losing stones when they are set in more delicate settings because of the movement, however creating a heavier style ring design can prevent this. Platinum is naturally white so the colour will never change, with a simple polish the ring will look brand new again. 18k white gold is 75% gold and 25% alloy. As gold is yellow in colour, the alloys that are used are various white metals such as palladium. These metals are what changes yellow gold to white. Because of the lower percentage of white metals to the yellow, white gold still has a yellow tint when compared to naturally white metals such as platinum. To get the bright white look, rhodium is used to plate white gold jewellery. 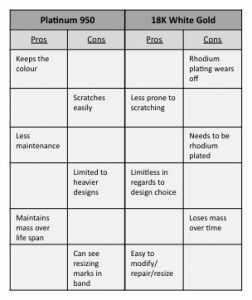 Rhodium plating usually needs to be done every 12 months, however depending on lifestyle, the rhodium can wear faster and the ring could need plating more frequently. You will first notice the slight yellow coming through at the bottom of the ring, where it rubs with constant wear. 18K white gold will scratch through everyday wear, the same as all other precious metals. As white gold is a harder (less pure) metal it is stronger therefore having less displacement, which means that if it is a finer and delicate style of ring you decide on, white gold is a better option.